Connealy’s books are always a pleasure to read, and Too Far Down is no exception! The story begins with a bang, and the action and adventure continue until the very end. I enjoyed Cole and Mel’s story with its delightful blend of danger, romance, faith, and family. Although it is not a necessity, reading this series in order is recommended for a greater understanding of the ongoing storyline. 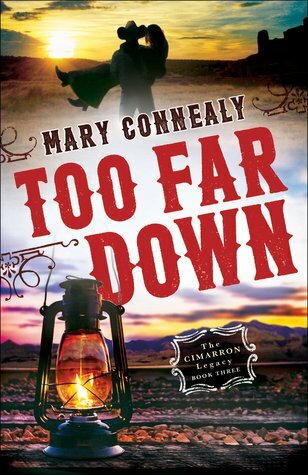 Too Far Down is a great conclusion to the Cimarron Legacy series! I received a complimentary copy of this book. No review was required, and all thought expressed are my own. When an explosion kills men and damages the CR Mining Company, the Bodens realize their troubles are not behind them as they thought. Shadowy forces are still working against them. Cole Boden finds himself caught between missing his time back East and all that New Mexico offers. Sure he fights with his siblings now and then, but he does care for them. He enjoys running the mine and, when he’s honest, he admits that Melanie Blake captures his interest in a way no other woman ever has. Melanie has been a friend to the Bodens forever. A cowgirl who is more comfortable with horses and lassoes than people, she never expected to find herself falling for someone. Particularly for refined Cole Boden, a Harvard graduate who may not stay long at the ranch. She’s determined, however, to help the Bodens finally put an end to the danger that’s threatened all of them. But will putting herself in harm’s way be more dangerous than anyone expected? Great review! I’m excited to read this series! I love the series read them all.